Preheat oven to 400°F. In a large bowl, combine ground chicken, egg, breadcrumbs, salt, onion powder, pepper, and 1/3 cup of green onions. Mix well, roll into 20 round meatballs, about an inch to an inch and a half in diameter. Place on a parchment-lined baking sheet. Bake meatballs just until the outsides are firmed up, about 5 minutes. 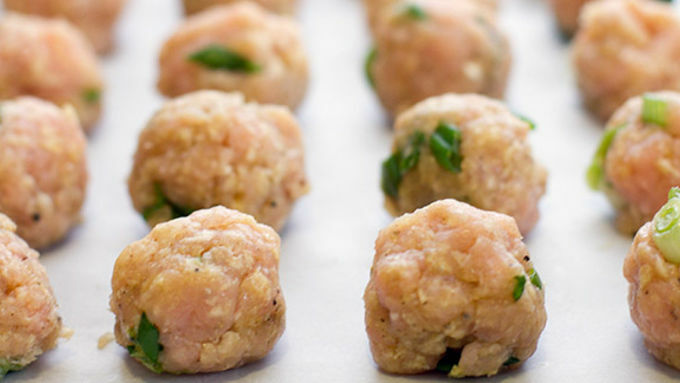 Transfer meatballs into a 4-quart slow-cooker. Cover with Buffalo sauce. Place lid on slow cooker and cook on low for 2 hours. Serve meatballs with blue cheese sauce for dipping, and garnished with a sprinkling of the remaining green onions. Enjoy! 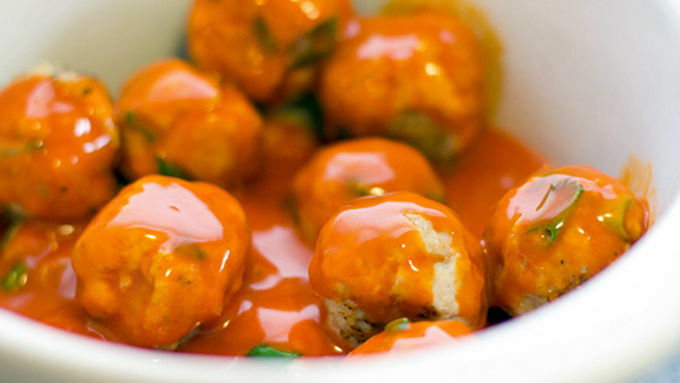 Get these Slow-Cooker Buffalo Chicken Meatballs going ahead of time, set them in your slow cooker and yum – they're ready when you want them! Grab a slow cooker and get pumped. You're gonna love making these yummy bites. 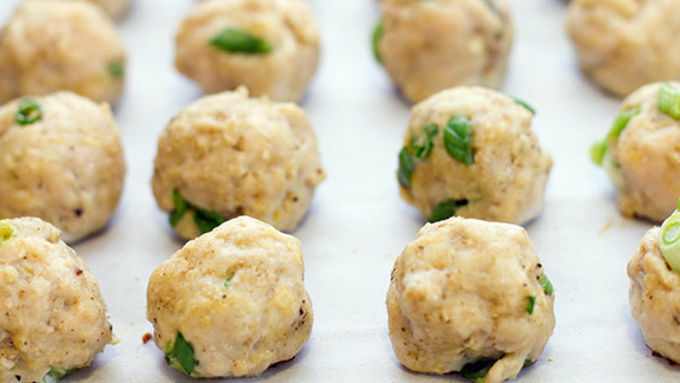 Place the meatballs on a parchment-lined baking sheet for a quick bit of par baking. That means we're just gonna give them a pre-bake to make sure they stay all nice and shaped once they're stuck in the slow cooker. Don't worry; this part doesn't take more than 7 minutes. Now, when adding the Buffalo sauce to the slow-cooker we're aiming for a full-blown slathering here. 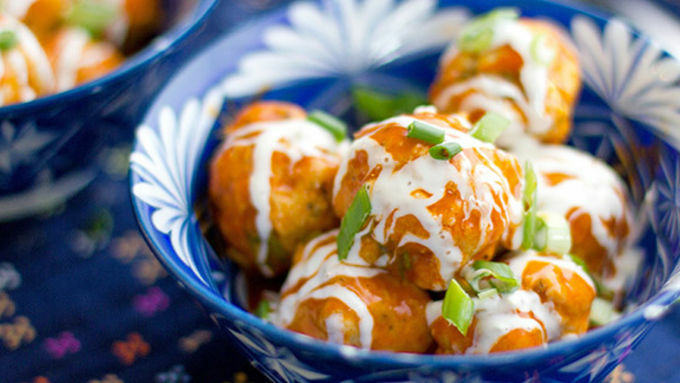 Go ahead and use an entire bottle of Buffalo sauce on top. 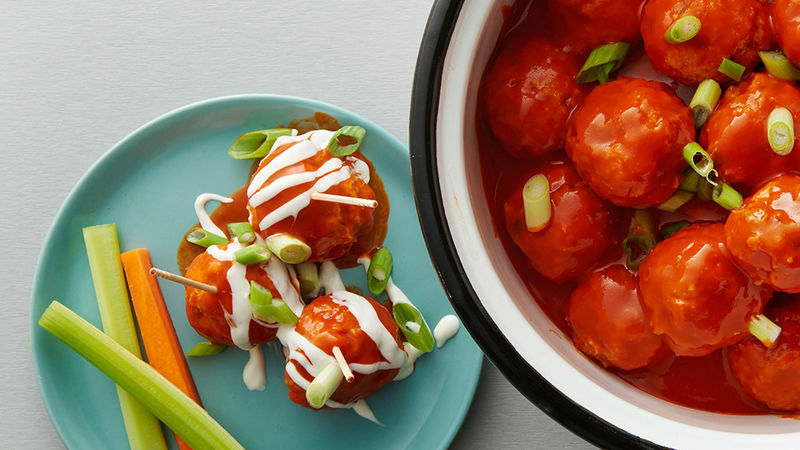 Cover and cook on low for about two hours, then pull those meatballs out of your slow cooker and serve them with a side of blue cheese dressing ... or if you're like us, just drench them completely with a hefty drizzle. Then grab a fork and go! go! go! Get in the game – it's time to eat!